marklin-users.net community | Forum » General topics » News from Märklin and others » Marklin 2019 new items - YOUTUBE Summer new items Set reminder. Marklin 2019 new items - YOUTUBE Summer new items Set reminder. That is the two tone green that was done in minitrix a year or two ago, looks quite attractive. Must go back and read the article in my Proficlub magazine, IIRC it was the Minitrix proficlub loco. I'm assuming ERA III with the "41" (vs. 141) designation? What types of cars/liveries pulled - I assume primarily passenger? Routes? Anyone have some insight on the prototype with this livery/era? Thanks! You should mark this date: On May 9, 2019 at 18.00 clock the summer news are presented for the first time on the Märklin YouTube channel at https://www.youtube.com/...UC_ulAkE0RxHUEhpvWf49pRQ the public. There you can experience the presentation in the form of a live broadcast. I think it is a good idea of Märklin! Edit: Brazilian Portuguese will also be great and for me better than any English! Well, we are 1 month into Autumn and we put our clocks back one hour next weekend. However, there are no Spring new items, so Marklin always seem to announce the Summer new items in April, so that you all can save your pennies for when the items arrive in the Summertime. Ah correct. Sorry I always forget that your or mine seasons are shifted by a 180°. Well, today I received a webnews mail from Märklin announcing the Summer novelties for May 9th, 2019 at 18:00 (well guess local time in Germany - do not know the time in New Zealand) on its You Tube channel by a livestream. "Diesen Termin sollten Sie sich vormerken: Am 9. Mai 2019 um 18.00 Uhr werden die Sommerneuheiten erstmals auf dem Märklin YouTube-Kanal unter www.youtube.de/maerklin-gp.de der Öffentlichkeit präsentiert. Dort können Sie die Präsentation in Form einer Liveübertragung miterleben." For me a little bit funny. Yesterday I received my 3 coaches (Märklin art# 43224) from the toyfair Nürnberg in 2018 - yes 2018 not 2019! BTW to which continent do you add New Zealand? Currently we are 12 hours ahead of Germany, but since you put your clocks forward an hour at 2am tomorrow morning then it will be 11 hours difference. Next week we put our clocks back an hour so the time difference on 9 May will be 10 hours. So, Summer New Items will be announced 4am 10 May New Zealand time - not that I'm staying up for it! 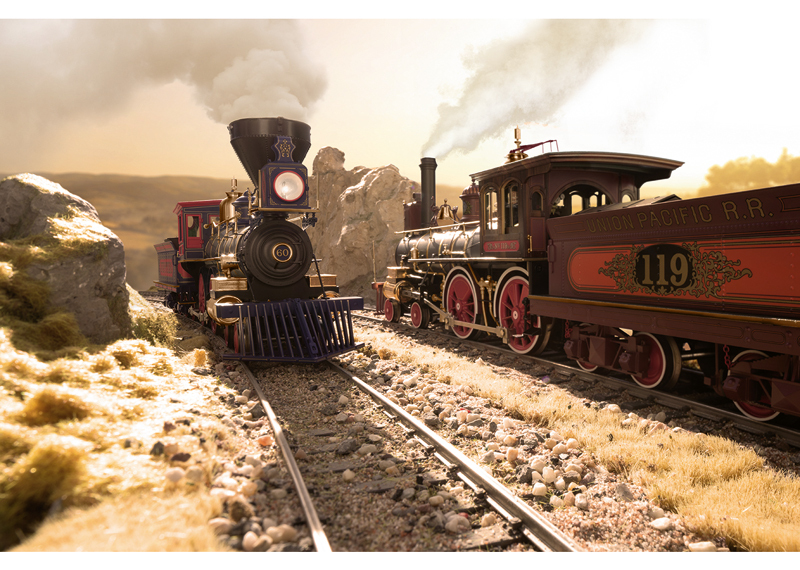 Just a rumour - Marklin to make a Golden Spike Steam Locomotive Set - info from marklin USA Digital newsletter. This is not by any chance about the “Maerklin-LGB” version? However I would not be surprised if they also do an HO version in Marklin and Trix, possibly with Minitrix and Z gauge versions as well. What is the significance of May 9th for the Summer NI announcement? When was the original Golden Spike ceremony? Wikipedia says it was May 10th 1898, and May 10th is a Friday this year, so the announcement is on the day before. That will allow them to have a big advertising campaign (along with everyone else producing Golden Spike locos) on the 10th. I think I would be prepared to put money on at least HO versions of the locos if I was a betting man, on that basis. If Maerklin wish to try something different in the smaller scales, they could include a couple of pieces of rolling stock with each engine. It appears from historical records, that each train (Union Pacific and Central Pacific) may have been equipped with at least 2 cars, possibly a baggage or utility plus a coach. The only real market for such a set is North America (in my opinion). It certainly would not do any harm. Bachmann have done, (maybe still do) HO models of both UPR 119 and CPR Jupiter. Maerklin (LGB) are busy promoting the two engine set now at a hefty price, but probably worthwhile for many train buffs and model collectors. you confused me, sorry, not May, 10th 1898 - it is a little bit too late. 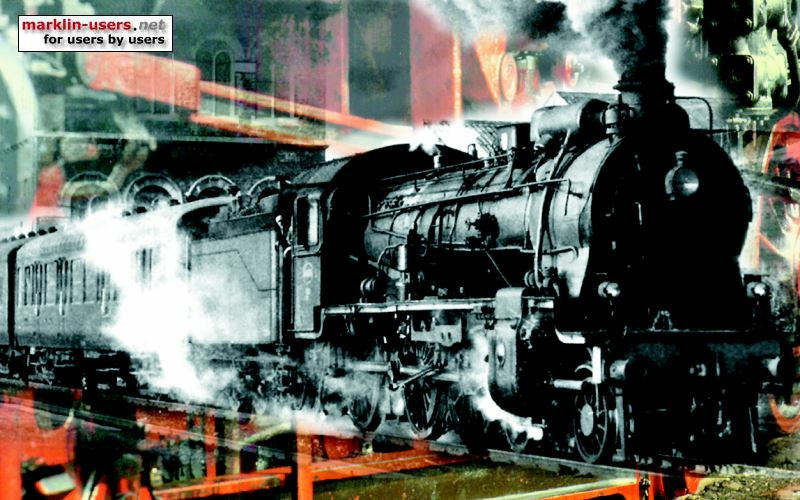 By Wikipedia it was May, 10th 1869.
or the "Wedding of the Rails"
Märklin, Inc. staff and Märklin Germany Export Manager, Mr. Janko Franke, will launch the Golden Spike Steam Locomotive Set at the Heritage Festival 150th Edition in Ogden, Utah on May 9 – 11, 2019 and at the Sesquicentennial Celebration at Promontory Summit, Utah on May 10 – 12, 2019. So I think the LGB version will be what we see in May and not other versions in other scales. I could be wrong of course but this will be of limited interest outside of the US and the LGB version is most likely all that they will offer. I could see Marklin making a re issue of the UP Big Boy in special display for the event. It would be easy for them to do since they have the tooling ready to go. I don’t seem them making any 4-4 loc’s for ho. I can speculate, too. What do yo see? The locomotives are shown on regular Märklin - 1-gauge track, not on LGB - rails. Rolling stock with LGB - wheels can't even stand on 1-gauge scale track without looking ugly with a gap between rail and wheel. For me this looks like that a product originally designed as Märklin-1-product has changed its flag in the last minute. Another SNCF 241 in Summer 2019 new item - Still yet to confirm. Tomorrow is time to open the big box!!! SUMMER NEWS ITEMS 9TH MAY 2019 YOUTUBE. Märklins new semaphore with the grey mast are still so late!